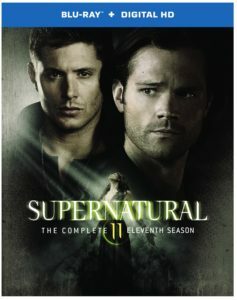 Supernatural passed Smallville in the CW Longevity game with a record-breaking 11th season; now, all of Season 11 is available on Blu-ray and DVD from Warner Bros. Entertainment. They provided us with a complimentary review cop y of this set; we are told we should point out that opinions are our own. So, let’s get started, eh? The Episodes: All 23 episodes of Supernatural Season 11 are on this set, and the eleventh season features a parallel to that of the Winchesters in that there are some family/sibling squabbles of the heavenly variety. My favorite episode of the season is probably “Baby,” an entire episode told around the legendary Impala car the boys drive. While some may criticize and claim Supernatural has run its course, I prefer to think of it on its third or fourth life, and as long as I see the people making it are having fun, I’m enjoying watching it. It’s nice to have a comfortable show where you have a general idea before going in if you’ll like it or not. The Extras: There are a few extras and featurettes. There’s also commentary on selected episodes: “Baby” with writer Robbie Thompson and director Thomas J. Wright; “Just My Imagination” with writer Jenny Klein and director Richard Speight, Jr.; and “Don’t Call Me Shurley” with writer Robbie Thompson and actors Rob Benedict & Curtis Armstrong. That alone makes me happy as DVD commentaries seem to be becoming extinct with these sets. But there they are, sure enough! There are also deleted scenes for a handful of episodes. As for the featurettes: As usual for a Supernatural set, they don’t disappoint. There’s a feature about Jensen Ackles directing “The Bad Seed,” which is cool, but what I really liked the most was an extensive featurette about some fans who won a “Real SPN Fan Contest” to visit the sets of the show. For one thing, it didn’t seem as awkward as some other fan features of its like; for another, I’m biased, having been to the Supernatural sets in Vancouver multiple times and knowing what the experience is like being up there. The nice attitudes of the cast and crew there are not just an act for the cameras; every time, they have been some of the most welcoming people, and I like that others can get a chance to see that on this DVD feature. The winners of the contest also all seemed so friendly and enthusiastic in sharing their love for the show, which is pretty infectious. Visual effects get a spotlight here too, with this one focusing on the added elements shown on the sets. It’s an interesting process, especially with things like Lucifer’s cage. There’s an extended look at the Amara storyline that permeated the entire season called “Shedding The Light On The Darkness,” and a lot of actors participated, which is nice to see. Finally, there’s a gag reel where we get to see what Jensen was wearing when Dean was washing “Baby,” among other things, and the Comic-Con panel for 2015 is included. Packaging & Design: I don’t know how Supernatural got full color disc art when things like The Flash didn’t, but I like it. The cover is decent; I’d like a new photo shoot soon though. Is It Worth It? Absolutely. We can watch Supernatural reruns on TNT or Netflix, but these extras plus the opportunity to see the episodes in high definition make it a wonderful experience. Order yours from Amazon.com at a discounted price and support KSiteTV! Supernatural returns October 13 on The CW. Photos from the season premiere can be found here.